Home / TallyERP.9 Lessons / How to do Period Lock or Restrict Back Dated Voucher Entry without TDL in Tally? How to do Period Lock or Restrict Back Dated Voucher Entry without TDL in Tally? Today we discuss about restrict back dated voucher in Tally. It is not a TDL method, It is inbuilt feature for tally users and we can use this option to disallow back dated voucher to specify users. Through this option none of the user enter or alter any voucher entry in previous year or previous period set by Admin. So lets start how to do this? First you need to use Security Control in Tally. Press Alt + F3 and Select Security Control or Press E button on your keyboard. 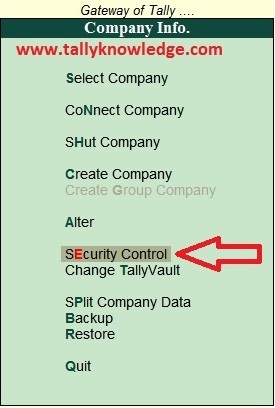 Select Security Control option, Select type of Security. 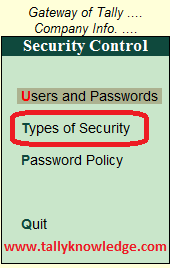 Enter user id and password for only used by department and accept, Save. Again go to types of Security and Select Sales. Select your department name in field "Use Basic Facilities of". Select your department name and enter 365 days and enter cut off date for back dated vouchers is 31st March of previous year e.g. 31-Mar-2018. You can also enter date of current period or any month end date for current year. Now do following setting and save the details. Press Enter and save the details. Now Shut the company and open with sales department user id and password. Try to create or modify the back dated voucher. It will show you no access allowed. Its all done. You can create as many as user and select same feature for the same.